The de Havilland DH.112 Venom was a British postwar single-engined jet aircraft developed from the de Havilland Vampire. It served with the Royal Air Force as a single-seat fighter-bomber and two-seat night fighter. 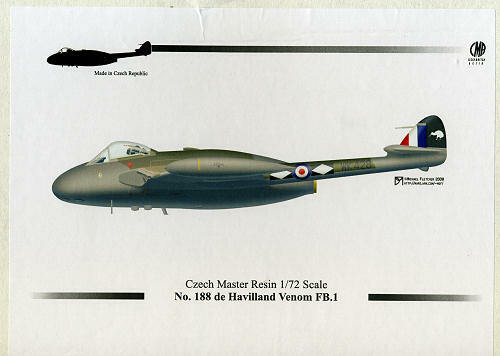 The Venom was an interim between the first generation of British jet fighters – straight-wing aircraft powered by centrifugal flow engines such as the Gloster Meteor and the Vampire – and later swept wing, axial flow-engined designs such as the Hawker Hunter and de Havilland Sea Vixen. 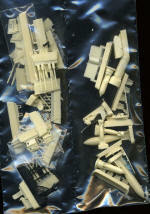 The Venom was successfully exported, and saw service with Iraq, New Zealand, Sweden, Switzerland and Venezuela. The first Venom prototype flew on 2 September 1949 and the first Venom variant, a single-seat fighter-bomber, entered service in 1952 as the FB 1 (the subject of this kit). Three hundred and seventy-five of these would be built. It was armed with four Hispano Mk V 20 millimetre autocannons in the nose and could carry either two 1,000-pound (450 kg) bombs or eight RP-3 60 lb air-to-ground rocket projectiles – the heavier bombs being an improvement over the Vampire FB.5. It was powered by a single 4,850 lbf (21.6 kN) thrust Ghost 48 Mk.1 engine. The RAF fighter-bomber Venoms saw service during the Malayan Emergency which took place between 1948 and 1960, although they did not begin operations until the mid-1950s with Nos. 45 and 60 Squadrons RAF. While there, the Venom supported operations against Communist guerrillas as part of Operation Firedog, the codename for Royal Air Force operations in Malaya. Venom FB.1s were lent to the Royal New Zealand Air Force for use in the same conflict where they operated with No. 14 Squadron RNZAF. 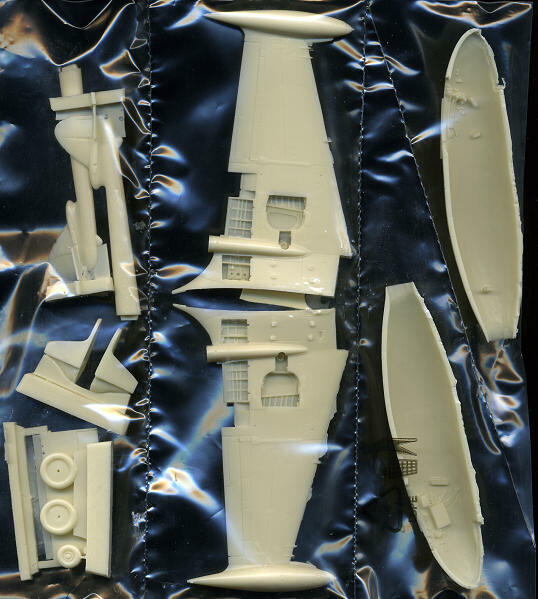 Anyone who has built a CMR kit knows that th ey go that extra step to ensure that the builder has as detailed a kit as the medium can provide. 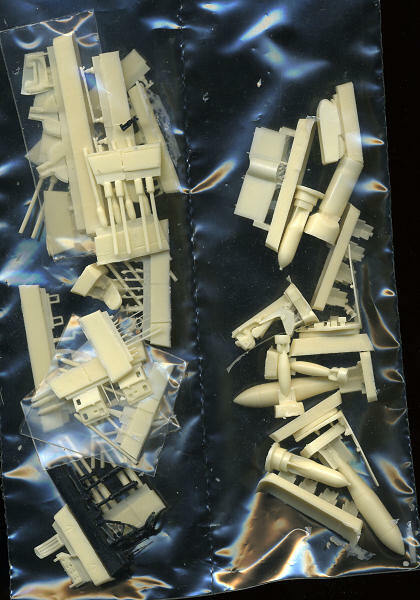 This kit has the parts segregated into several sections of poly bag to keep the heavier bits from causing havoc with the lighter and more fragile parts. It includes two photo etch frets, one of which is in color and mostly for the cockpit. Two nicely molded vacuformed canopies are also provided. CMR also includes a set of canopy masks that are most welcome as well as a small photo-etch guide to help get the individual rocket fins properly aligned, also a nice touch. 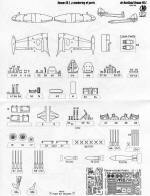 When one looks over the parts, one can see how well detailed they are. Finely engraved panel lines of consistent depth, molding on the inside of the cockpit walls and frame detail in the flap area are just a few of the highlights. There are several options. One is to have either a standard seat as used in early FB.1 versions or a bang seat as was retrofitted in all planes in 1954. Separate cockpit floor/bulkheads are provided for each one. There are options for carrying either the bombs or the rockets. Though it seems one could install both, one has to realize that 1,000 lbs was about it per wing. Though nothing is impossible, rarely were the lighter bombs and a few r ockets mixed during a mission. It was generally one or the other. There is also an option over the style of wheels to be used. Photo etched wheel covers are given and one can use either of two designs. No indication is given of which goes with which markings option. I doubt it matters. Landing gear are made from what seems to be a black plastic so you can be sure it will hold up under the weight of the model without deforming. Probably the biggest challenge will be nose weight. Instructions show that some is needed, but how much will require some testing with all the bits taped together to be sure enough is installed. The instruction packet is top notch. 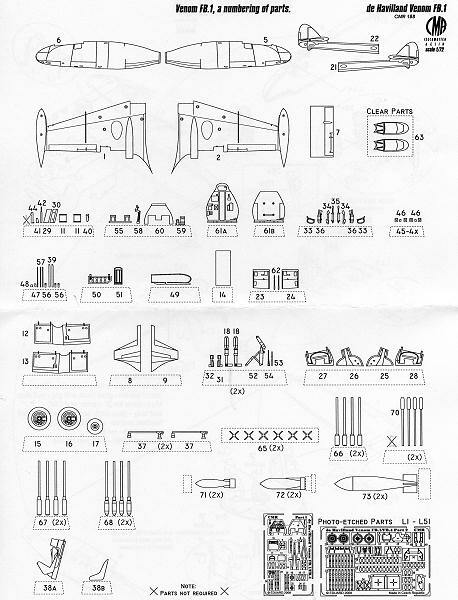 There are five pages of build instructions that not only have superbly drawn illustrations, but also note all the changes between early and later variations as well as the options one can use. Each of the six markings options has a sheet to itself. All are in the standard RAF scheme of the day which is dark green, dark sea grey and PRU blue. These would be gloss in all probability. 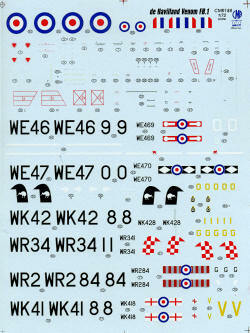 The decal sheet is superb with all the data markings and unique markings provided. There are three aircraft from 14 Squadron RNZAF, a 14 Squadron plane base at Tengah in 1957, one with the 94 Squadron aerobatic team from 1955 and a 145 Squadron plane from the mid-1950s. 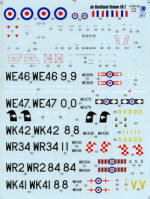 On some schemes there will be some painting of tank markings required, but all the RNZAF rudder markings are on the sheet. Two pages are devoted to data markings placement. Finally, there are five pages of clear photos of these planes to assist in details and a short history of the type is provided. Those who have been around models for a while know that this is not the first Venom single seat kit done in this scale. Frog did one way back when and Aeroclub also produced a nice short run injected plastic kit that is now difficult to find. This one eclipses all of those and any other that has been produced in any scale. It is not cheap, it won't 'fall together', but the end result will be a beauty. My thanks to CMR for the review kit. In North America you can get them atwww.westcoasthobbys.com . In the UK visit www.cmrmodels.co.uk to see what's available. http://www.hannants.co.uk/ is the British distributor.